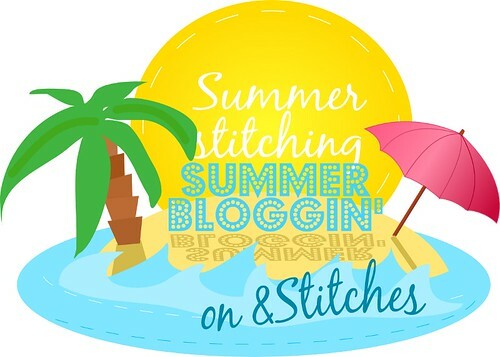 Today we welcome back Amy Byrne, from Random Acts Of Amy, who is sharing her second Summer Bloggin' post with us. Last month she showed us how to incorporate watercolor into our embroidery; today she'll share tips for teeny-tiny stitching! I’ve been hand embroidering since I was 11 /12 years old … so around 1980/1981, but I really started it up in earnest in 2009. Back then, I tended to use 8”, 9”, and 10” hoops. I’ve noticed that as I’ve expanded my skills, and also as I’m creating more items for sale, I’ve used smaller and smaller hoops for my work. Nowadays my standard size is in the 4” to 6” range. One of my favorite kinds of hoops to finish my work off in is Dandelyne mini hoops. 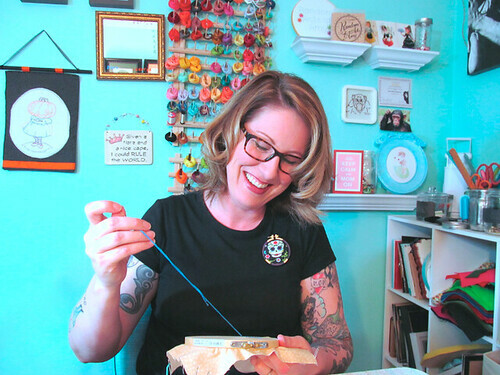 For those of you who don’t know, Dandelyne’s founder, Sonia, has created tiny, wearable embroidery hoops that come in a variety of sizes, but, still, when thinking about an embroidery hoop, tiny is the operative word! 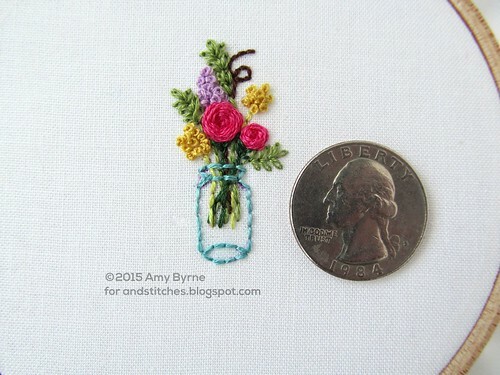 Today I’m going to give you step-by-step instructions to creating a mini hoop with a little Mason jar with a bouquet of flowers in it. After the embroidery is finished, I mounted it in a Dandelyne mini hoop that’s 34 mm x 62 mm (1.34” x 2.44”). One thing to note about the mini hoops is that you don’t use them to hold your fabric while embroidering; you use it to mount your work after it’s finished. While embroidering the piece, I used a 4” hoop. An important point to think about is the thickness of the floss. When I’m embroidering on such a small scale, it would be a rare occasion that I’d use all six strands of floss. In fact, it’s rare that I’d use five, four, or even three strands of floss when I’m embroidering on this small of a scale. 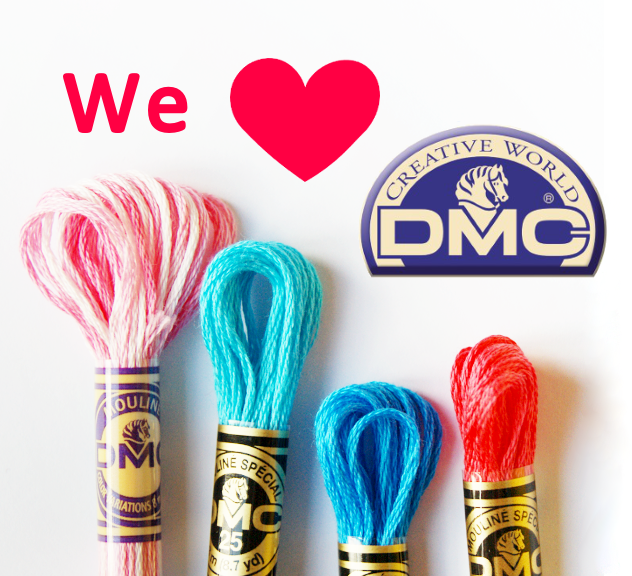 As you can see from the picture below, there’s a big difference in the thickness of the floss from six strands to one. When you’re working in this fine of detail, the fewer the strands of floss, the better. Another point to think about is the thickness of your needle. When creating work to go into a mini hoop, or any other small frame, a thinner needle with a smaller eye is your friend. 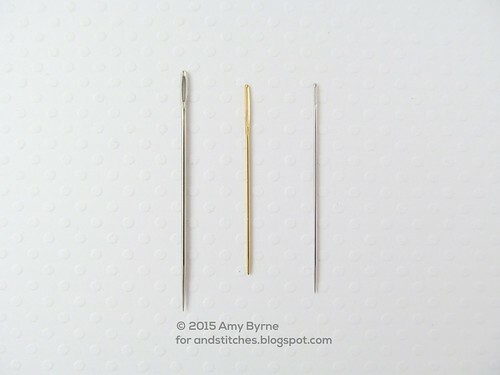 All of the needles in the picture below are specifically for embroidery, but I use the needle to the far right. It’s thin with a smaller eye, so it doesn’t poke big holes in the fabric, and I feel like I have more control. The first thing I do is trace the inside of the mini hoop with my trusty Clover air erasable pen. The kind I have has an eraser on one end, and it’s one of my staples while creating embroidery. By tracing the inside of the mini hoop, I know how much room I have to work while embroidering. 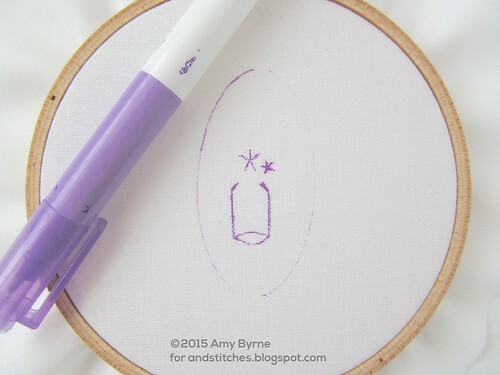 Next, I use the air erasable pen to draw on the shapes I want to embroider. I used 2 strands of floss for all elements. I start with the bottom part of the Mason jar (you’ll embroider the top part after you have the stems embroidered), and mark down the spokes for the woven wagon wheel rose. Tip: When embroidering a woven wagon wheel to create a rose, always start weaving your floss under the first spoke, then go over, then under, etc. until it’s filled. It makes a much more pleasing-looking rose. 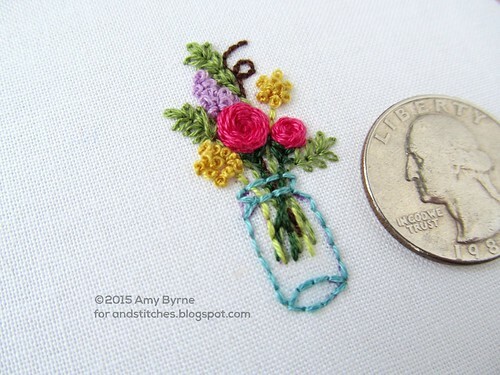 After embroidering the bottom part of the jar and roses, I make vague markings as to where I’ll put a couple of more bunches of flowers and spiral twig. After I embroidered those elements, I add markings to put in ferns. They add a nice splash of green, and fill out the bouquet. And here it is after all parts have been embroidered! As you can see by the placement of the quarter, it’s quite small. All elements are embroidered using 2 strands of floss except for the fern on the right, drooping down, which has one strand of floss. I did end up having to re-draw and re-stitch the Mason jar to move it down because I didn’t have enough room to embroider the top part of the Mason jar where the lid screws on. 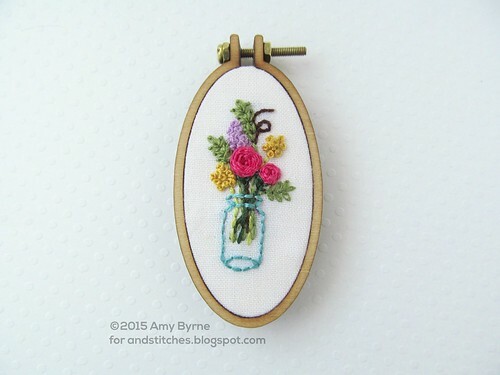 After I’m happy with the jar and flowers, I mount the embroidery into a mini hoop and add a necklace. 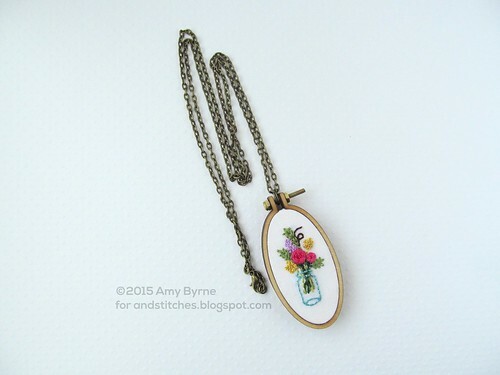 I hope that this has inspired you to try out embroidering on a small scale. 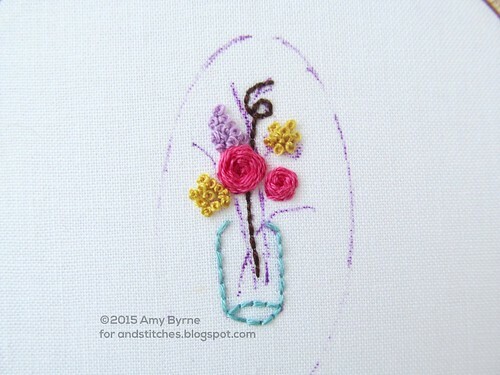 It might be outside of your usual type of embroidery, but it is a fun style to try. 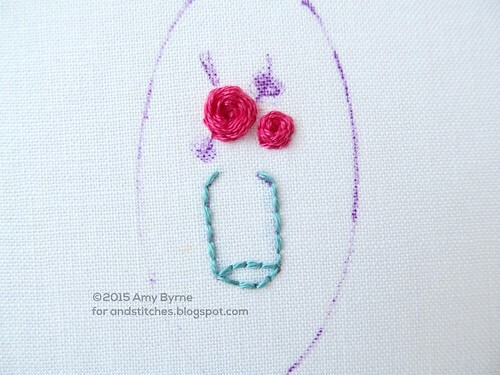 In addition to mini hoops, you could embroider on a small scale on 3” hoops. 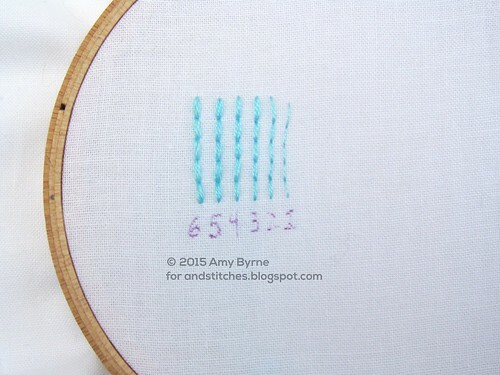 Instead of sizing a pattern to fit in a 5” or 6” hoop, scale it down to 3” and try it out! 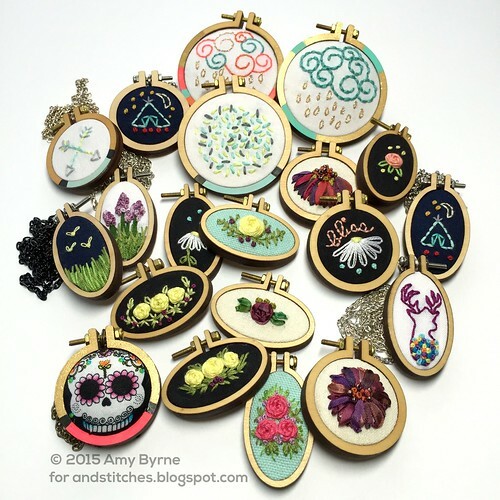 Amy is a hand embroidery artist who embroiders images and text that range from the whimsical, to the unexpected, to the evocative, on a range of playful and vintage-inspired fabrics. A library branch manager by day, she spends pretty much every other waking moment as the creative force behind Random Acts of Amy. You can find her online on her blog Random Acts Of Amy, Instagram, Facebook, and every Friday on the Feeling Stitchy blog for Friday Instagram Finds. She’d love for you to stop by and say hi! That's so pretty! 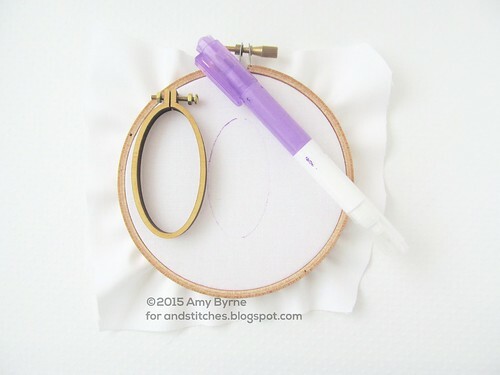 I purchased one of the mini hoops to try andmake myself a cross stitch necklace using water soluble canvas but I think I may have to give hand embroidery a go instead.